Raccoon kits living in a Pepsi machine. The Admiral did not find me in a rocket and raise me. Nor did he launch me into space (though I strongly suspect the thought crossed his mind from time to time). But like Jonathan Kent, The Admiral (with no small assist from the KareBear) did his best to instill in a young League some sort of moral compass. While I think he would have frowned upon my adoption of a cape and sky-blue tights an an outfit of choice, like Pa Kent from the movies and books, The Admiral's role as a father was a bit more involved than occasionally peering over the top of his newspaper or teaching us how to throw a baseball (which he did as well, with mixed results). We were lucky to have parents who saw our challenges as teaching opportunities, and who asked us to reach our own conclusions as we forged ahead. I don't want to go on too long and get sappy and boring, and some of this is deeply personal. But I consider myself fortunate every day to have had the balance of parents that I could not have been luckier to have had, had I been flung across space to touch down in a field and be picked up by Glen Ford. The Old Man is a good guy, and I can only hope to do him proud. So on Father's day, I salute thee, Admiral. So, Funny Papers was a comic shop that was in Dobie Mall, on the South West edge of campus. It had been there since I was in high school, and changed hands at least four times I knew of. Thanks to its approximation to several places I worked, I had been a customer for years, but as it was, bottom line, not as good a shop as Austin Books, I quit shopping at Funny Papers and switched to the less-convenient-from-work-or-home Austin Books. I noticed about a month ago that the doors had been locked on Funny Papers buy the property management company. Last I checked, the stock for the store was still in there. As Austin has always struggled to have shops that could last (except for Capstone and Austin Books), and at least three other shops had closed since I moved here in '06, I was sad to see it go. But... I checked the URL for their old website (which was pretty awful) to see if they'd made note of what was going on, or alerting their customers to some sort of gameplan. Instead, the www.funnypapers.com re-directs directly to NSA.gov. Shouldn't "Sunny" Be Back on Soon? Leaguers may know I'm a fan of the FX Network program, "It's Always Sunny in Philadelphia". And it seems like a good, long while since Season 4 ended (with a performance of a musical of "Day Man/ Night Man"). 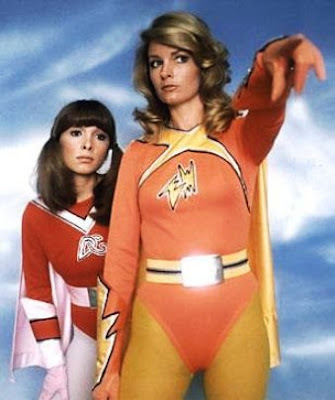 And while I already have a foul-mouthed, skinny blond at home, it is time for another round of Sweet Dee. I wouldn't Tivo the show for your kids, but its good stuff. The internet tells me that it'll be coming back in September. I know you see three shirtless dudes here, but do not let that fool you. Shocking nobody, Jon and Kate of reality TV show "Jon and Kate Plus Eight" sound like they're heading for divorce in a much more than speculative way. Here. While indeed morbidly fascinating to watch, its not fun to write about. But if you've seen the show of late (which has taken to inserting special celebrity guest stars to distract from the fact that Jon and Kate have no interest in communicating), this should be no surprise. May Jon find his stripper and head for Tahiti, and Kate get... whatever. Mostly, I will be curious to see the follow up in "People" in 2020, updating us on whatever happened to these people. I think they have contracts with TLC that go for another two seasons. I have no doubt TLC will be holding everyone to those contracts as its sort of untapped territory for television. I did not grow up knowing my aunt Joann terribly well. My paternal grandmother's sister, she lived in Mesa, Arizona, which was pretty far away when I was a kid. However, she came to visit when I was in college, and Jamie and I were thrilled that she was able to join us in Austin when when we got married. And, of course, when we moved to Arizona, she lived only about 30 minutes away. We spent a few holidays with her, would go visit on weekend, stuff like that. My aunt Joann passed this week. I found out today while at the conference. While I was only able to know her for a short while before she began having trouble with her memory, and as much as I enjoyed spending time with her even after she began having problems, I'll miss her. I should mention, I was at a conference here in Austin today, will be so tomorrow until quite late, and then again on Thursday. My usual blogging and comment section maintenance is going to be less than perfect. Also wanted to say: Tank Girl is a deeply flawed movie. I'm trying to watch it on cable, but it's pretty bad. Comic folk and Hollywood could learn some lessons regarding what not to do with Tank Girl. So much potential, and it sort of sputters around like they had no idea what they really wanted out of the movie while they were making it. Add in a layer of early-90's sheen, and TV-style directing, and it feels not entirely unlike one of its contemporaries in the Pauly Shore wacky-movie genre. I find it odd that I often hear folks defending the movie. It may be that I felt Lori Petty's reading of the titular character mistook blaring every line in the same cadence for sassiness. Plus, the kangaroo dudes just don't work. I don't care what was in the comic. Oh God, Malcolm McDowell... did you ever have any shame? I think we basically hit a point at which the folks who are enthusiastic about Twitter and those of us who are less so were just sort of squawking uselessly at one another. We clearly use, used or would use the technology in different ways, and do not share the same perspective on how we engage in the communication cycle. Different technologies are going to expose these things in different ways. The bottom line is that we are in a world where instant communication is possible on a massive scale, and in the hands of anyone with an e-mail account, a username and password. As NTT would point out, that's an incredibly important thing in events like the Iranian election or a natural or other disaster. For all the good it can provide, Twitter has a ways to go, and people will need to be very careful in how they use it once it becomes part of expected types of communication. We all need phone lines, and they're also good for passing emergency information, etc... but if the phone rings off the hook from telemarketers, we taken them off the hook. Heck, I confess that even if the phone rang all evening from friends and family, I'd keep it off the hook. And that's where I am with Twitter right now. I don't expect this will come remotely close to closing the book on Twitter in the comments section or at this blog or elsewhere. But I'm shelving the topic for a while. We are, of course, all over Facebook. We're in the middle of working on incorporating Twitter into our professional life, and, in fact watched part of a panel of archivists discussing how the Tweets from Iran would be preserved for future generations (using the near complete loss of record of how Tiananmen Square played out. I think it also raises some questions regarding expectations of one another not just in ownership of devices that can handle and manage these modes of communication from a financial standpoint, but the fact that we're now so attached to our devices that instant messaging at all times from any direction doesn't seem unreasonable to many. That may be overstating it a bit, but I'm not sure its by much, whether you're spending time managing your communication or not (and it is, in my personal and professional experience, a tough thing to explain that most people prefer their tools do this for them. They do not wish to spend their time monkeying with and tweaking their tools). I gotta go to bed. There's been a load of speculation about the 600th issue of Captain America that was released today (two days earlier than the normal comics' delivery day each week). Looks like that speculation can come to an end. A couple of years back, Cap was shot on the steps of a court house in NYC, and keeled over dead. Since that time, former protege Bucky Barnes, his WWII-era sidekick turned lethal assassin, had put on the cowel, picked up the shield and done his best to fill Cap's boots. What should have been some serious comic-book hackery has, instead, been some of the best storytelling in the Marvel U that I'm aware of (in my humble opinion). Its just been great comics. Marvel has been happy to try to play up any minor event in their comics in the major news outlets, and did so again today to coincide with the release of today's comic. I can say no more, but there's a major spoiler after the jump. Simon reminded me, so its in the post tonight!, that the upcoming Wednesday Comics from DC is not going to just be appearing in comic shops. DC is taking the format, which I've actually criticized as a throwback, and moving forward to the future for comics. The weekly comic is in an old (very, very old) format of the newspaper broadsheet, with something like a page or two of the story being released each week. 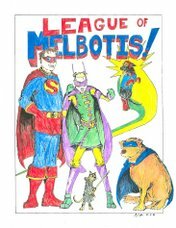 Sort of like the old Little Nemo comics or a Flash Gordon comic. And, yeah, its only a 12-week thing, but I think that's just their test period for both print and online. Oh, and here's some preview art for Wednesday Comics. BUT... DC is going back to the future. They're also syndicating to USA Today online. What this means is that DC is finally, finally getting online. I think this is a cool opportunity for DC to dip their toe in the internet waters with their major characters. Sure, I think they should be moving their entire library online, but... babysteps. 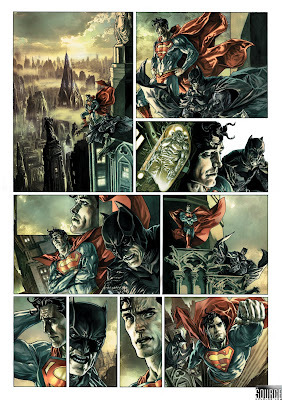 AND, you guys will, I assume, be able to read at least the Superman comics, and maybe a whole lot more! Anyhoo, here's the story from USA Today. And here's the DCU Blog article. 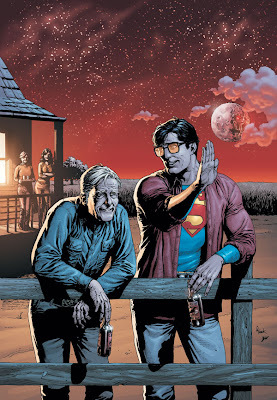 Here's some Superman art. Pretty nice! click for a bigger image. See Supes and Bats in all their glory! Apparently last week was Donald Duck's 75th birthday. Like most kids born after 1935 or so, Donald Duck was an ever present force in my formative years. The pantsless sailor duck was a welcome face on our TV screen and during the occasional 16mm film at school. 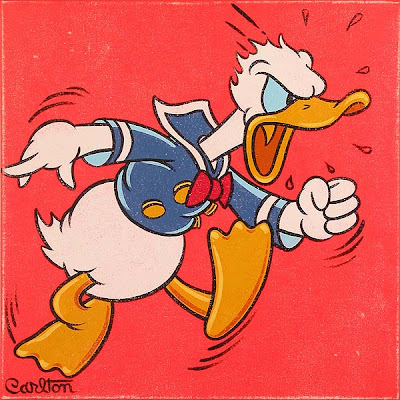 I don't want to take anything away from Donald, but I do remember being maybe a little freaked out by his rage attacks as a kid, and was probably 5 or 6 or so before I found them funny and realized they were intended to be wacky and not vaguely threatening. I think I thought of Donald as an adult, and when adults flipped out when I was very little, I sort of flipped out a little on my own. It was the Chip'n'Dale/ Donald stuff that I think won me over. Dude! There's a ton of Disney stuff on YouTube! Anyway, who doesn't love Donald Duck? I sure do. 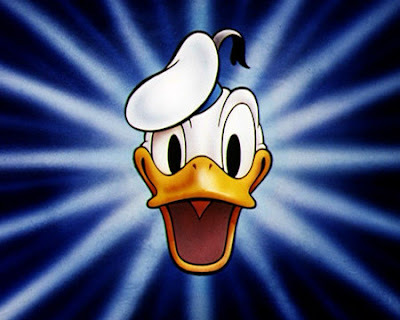 And just to make matters better, the Duck comics from Disney are something I read from time to time as an adult, so Donald is still with me today, in a slightly less animated form. * Like many, having grown up with Disney characters as such a big part of our entertainment, I may not have a sense of ownership of the characters, but Disney's attempts to make me think of Donald, Mickey and much of the rest of Disney characters as pals has completely worked. When we went to Disneyworld in 2000, I got weirdly excited about having my photo taken with characters, and had a repeat in 2002 or 03 when I attended a conference at Disneyland. Happy Birthday, Donald! Perhaps this 3/4's of a century, someone at Disney will buy you some pants, pal. *I think Boom! just landed the Disney contract, so expect more Disney comics soon, if true. At a reasonable price, too!